Exchange with the academic world is an important channel for discussing ideas and analyses with a critical and informed public; for sharpening one's arguments and for meeting the next generation of leaders. 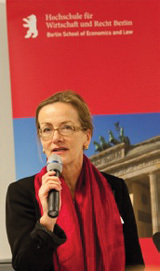 In 2012/2013, Jacqueline Hénard will give conferences on perspectives for France at the Internationales Zentrum für Kultur- und Technikforschung in Stuttgart and at the Schweizerisches Institut für Auslandsforschung in Zurich. In Paris, at the prestigious ‘Sciences Po’ – where she has been teaching for many years - she will give a series of lectures on changing Germany ahead of next year’s federal elections. Her first sabbatical took her to the Center for Economic Performance at London School of Economics, where she participated in the work group chaired by Olivier Blanchard and Larry Summers on the transformation East European economies. Later, Jacqueline Hénard joined Science Po's Centre d’études et de recherches internationales de Sciences Po as a guest fellow and, most recently, spent some time at Wissenschaftskolleg zu Berlin, where she finished a book on every-day life in Berlin during the Cold war that has been published since.